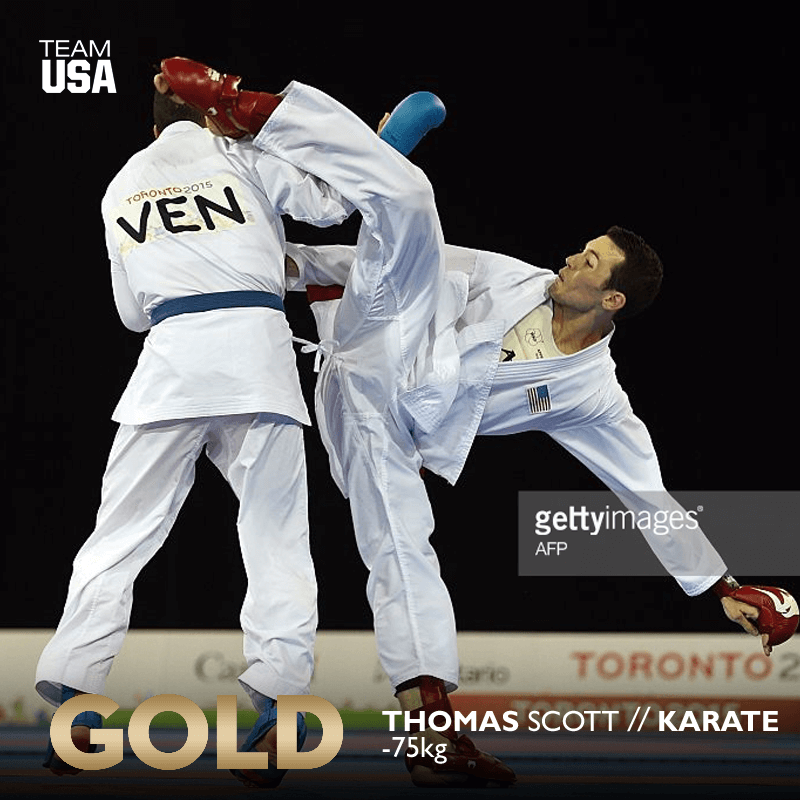 Karate athlete and USA Team Captain Tom Scott is ranked among the top athletes in the world for his sport. With years of national and international competitive success, he is admired for his technical and physical abilities. Beyond that, he has become a role model and respected figure across the globe for his character and the demeanor with which he approaches his training, competition, and life outside the ring. 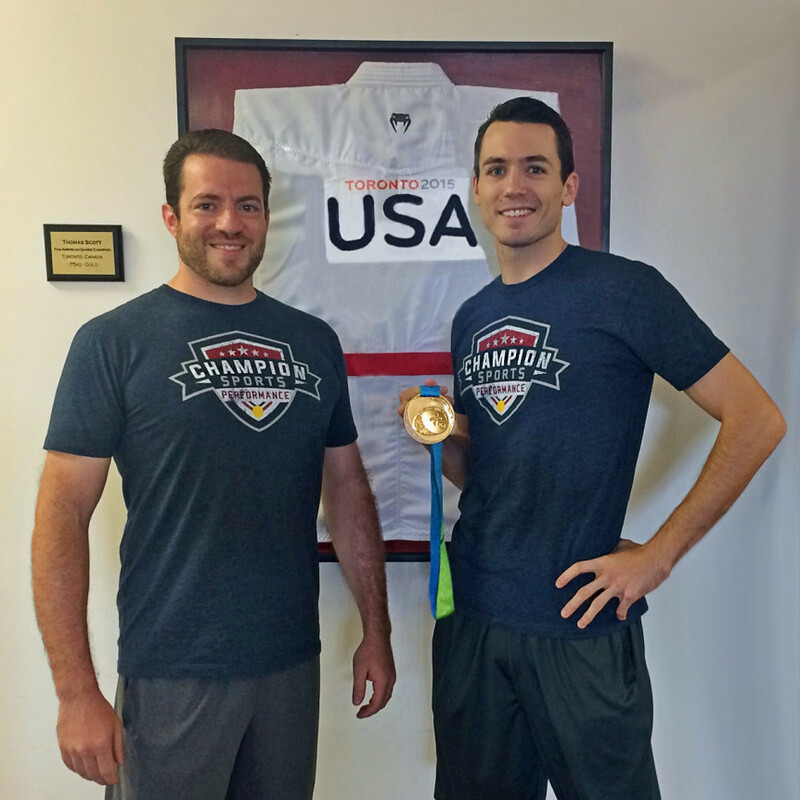 This past summer Tom led Team USA into Olympic level competition at the Pan American Games and earned a gold medal. This accomplishment is surely a career highlight, but even after bringing that gold medal home to Texas he hasn’t stopped looking forward to what the future holds. Champion Sports Performance’s Coach Chris Stratis has helped with Tom’s training for several years. As they prepare for his upcoming season, Coach Stratis interviewed Tom to get his thoughts on training and being an athlete, what it means to be a champion, and much more. Tom Scott wins gold at the Pan American Games. Photo courtesy Getty Images. Coach Stratis: Long-term athlete development (LTAD) is an important topic for athletes, parents, and coaches to be aware of. As young athletes develop their athletic abilities, explore a variety of sports and movements, develop technical skills and eventually compete at the elite levels of their preferred sport, the principles behind LTAD can guide them through a healthy and successful career. When did you first become interested in sports? What sports did you try? Tom Scott: I started soccer and baseball when I was about 7. The funny part is that I didn’t like kids getting too close to me on the soccer field. I had a strong sense of personal space. Here I am today trading punches and wrestling with opponents on the tatami. I don’t remember, but my mother says my first time at bat I hit a “through-the-legs” homerun. It never happened again. You can imagine the high expectations for a young kid. I didn’t much like baseball anymore. Besides karate, football was my big childhood sport through middle school and into high school. Coach Stratis: Did you make a deliberate decision to pursue elite level training and performance in Karate? If so, when? What motivated that decision? Tom Scott: Its funny, when I read this question, I want to say “last year!” It seems that every year I reach a new point of no return. Every year I discover a new level of personal commitment I have never known before. I guess high school was the first turning point for me. I had the opportunity to travel to Chile with the U.S. junior national team my freshman year, but I would miss a critical week of two-a-day practices with the Jesuit football team. Football never had my full attention from that point on, despite losing first round in Chile. I was captured. Coach Stratis: Most people can only imagine what it takes to prepare and perform at an elite level year after year. What sacrifices do you make to be an elite athlete? Tom Scott: It is difficult for me to answer this question. I have to really search for sacrifices. Things that would normally be seen as a sacrifice, I consider a pleasure. I enjoy watching my diet, waking up at 5:30, and spending hours focusing on getting better at something. Over time, as I look at my daily routine, friendships and goals, I guess I have sacrificed the normal life. I am fine with that. Coach Stratis: What does it mean to be a Champion? Tom Scott: In my mind, the title of Champion is awarded for a few things. A champion is someone who has sacrificed the normal life. They embrace the difficult and the painful, knowing the power hidden behind those two things. They are consistent in their training and in their performances. A champion rebounds after losses and is therefore never defeated. That is the crucial difference. We will all lose, but a champion cannot be defeated. If given the chance, they would fight that rematch again and again until they won, and when they’ve won, they’ll fight it again because they love it. Coach Stratis: Who are some of your heroes (athletes or non-athletes)? Tom Scott: An athlete hero would be Usain Bolt. I follow him on social medias and half of his content is of him laying on the ground exhausted. It shows that he enjoys laying on the track. He feels at home after the effort. My newest hero, and someone I am trying to build a relationship with is Saint Sebastian. Saint Sebastian is the patron saint of athletes. His story is one of endurance through physical pain, and fearlessness when faced with certain death. He helps me be bold, take the risk, appreciate the moment, all with proper perspective and outlook. Coach Stratis: 2015 has been an outstanding year for you – with victories spanning the prestigious Karate 1 event in Brazil to yet another USA Open victory, to becoming the Pan American Games gold medalist. What do you see as your biggest accomplishment in your sport, and why? Tom Scott: Over time I have become someone who always looks forward. This year has been a blessing, and I worked very hard for those events, but I will always believe that the best is yet to come. Next year winning a world title at the WKF World Championships will be my greatest achievement. But as soon as I come home, I will be looking forward to returning to the World Games and World Combat Games in 2017. It is just how I operate. I definitely take time on occasion to reminisce great performances, but I guess this is proof that I am in this for the journey and not the end. Coach Stratis: What are a few things that are part of your training that have been key to your success? Tom Scott: There are so many components here. I am very team oriented in my individual sport. I am fortunate that I can rest crucial tasks on the people closest to me. I am lucky. There are two things I need to do: show up, and sweat. I get to spend the rest of my athlete free time studying my sport and myself when many athletes have to structure their own workouts and trainings. We have outsourced my weight training to Keith Scruggs a trusted friend and trainer with years of Team USA experience. For almost 5 years now I have been sprinting with you and Champion Sports Performance. I attribute much of my growth to time spent at a cold, dark, high school track. Finally my life long Sensei and Coach Brody Burns keeps it fresh in the dojo. As far as key to my success, Sensei Burns has always focused on technique. Being a “technician,” or a “sniper,” as he would put it, is our focus. Sensei stresses having the cleanest technique in the country and world. 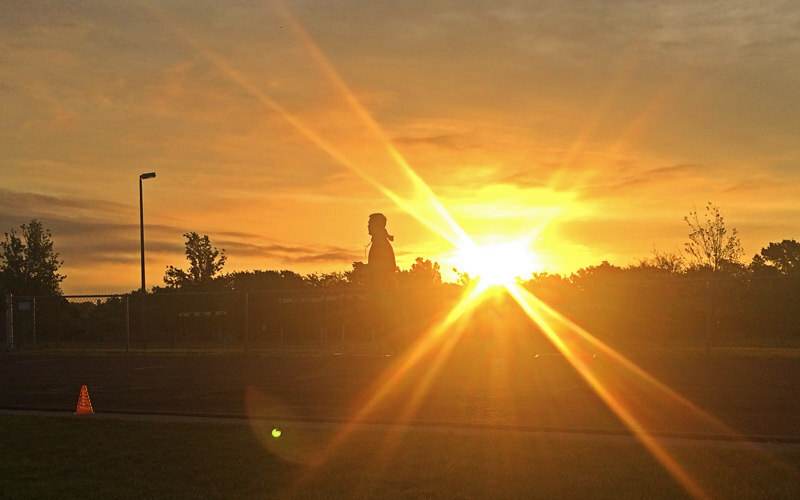 Tom Scott training at the track as the sun rises. Coach Stratis: How do you set your goals? Tom Scott: I will have the major event of the year in mind (WKF Worlds/Games events), but also have smaller goals that lead to the major events. Underneath those I have the base, day-to-day goals that must be kept regular if I am to expect consistent performance on a high level. Coach Stratis: What is your biggest challenge as an athlete, and what do you do to manage this challenge? Tom Scott: My biggest challenge is fortunately not very complex. It is a simple concept of making the most of every moment of work. Sometimes it can be tempting to walk through a workout or practice without maximum effort. I have to make sure that every pushup, punch thrown, and weight lifted is with intent. That every movement lifts the ceiling of what I can do. Coach Stratis: What was the best advice you were ever given? Tom Scott: I went to Sweden for a seminar a few years ago. After getting to know each other pretty well over the course of that weekend, this 10 year old boy took a moment to give me some advice during a long car ride. He was very articulate and smart for his age. He told me that he had been watching me that weekend and he really looked up to me. He then asked me if he could give me some advice. I was surprised by this whole moment and knew that it would be special. With such sincerity and passion, he told me that I was his hero, and that I should never be afraid, nervous, or anxious about anything. Isak’s words struck me deeply and I often remind myself during major moments that he, in addition to many, believes whole heartedly in me. Coach Stratis: Do you have a saying or motto that you live your life by? Tom Scott: “Never settle.” I heard it for the first time as a freshman in college when a senior gave me some good advice to always take on as much as your time and energy could allow. You can cut back if it’s too much, but at least you weren’t afraid to add to your schedule. I use this saying now to motivate my effort levels in trainings, and also still to challenge my daily productivity. Coach Stratis: Where do you draw your inspiration from? Tom Scott: My inspiration comes from my faith, which frames everything in proper order. I work hard to build my relationship with the Heavenly Father and I study often to further my understanding of what it means to follow Christ. Coach Stratis: Do you have any recommended resources or tips to share? Tom Scott: I would direct everyone to their greatest resource: themselves. We gather so much data every week/month/year. If we can pick up a key lesson from every practice, tournament, win and loss that we have and engrain it in ourselves, then we improve every day. The trick is capturing that valuable data. I use flash cards and a journal. Coach Stratis: You’ve been a great role model for people all around the world. So many younger athletes see you as a role model and inspiration. What do you think of that? Tom Scott: I embrace it. I love it. It is a great source of energy and motivation for me. I also see it as a big responsibility too. When I fight, I bring all the people who support me with me. Meeting kids and fans at tournaments and seminars is one of my favorite things to do with this role, and I will always hold that with great value. As Tom competes across the country and around the world, you can keep up with him and show your support on the Tom Scott Karate Facebook page.